One of the images I wanted to add to my collection of San Diego aerial photos was a very wide, very detailed image of the San Diego Coronado Bay Bridge. I could have taken a single image with a very wide lens — such as this image taken a few years ago that has since paid for the flight many times over — and achieved a reasonable result, but as far as high resolution goes this approach has its limits. The wider the lens, the more distortion is present in the image (think “fisheye view”). Correcting such distortion reduces the sharpness of the details especially around the edges of the image. Also, a single photograph will be limited in resolution by what the camera can record — these days, 36 megapixels is typical. What I really wanted was an enormous, highly detailed, and rectilinear (straight lines, no fisheye distortion) image suitable for large reproduction in a space that would warrant it, such as an office lobby, museum, or the Oval Office. Equipped with the most expensive and high-tech ball head in the world, my daughter and I got up in the air and set about shooting the images. I later stitched them together on the computer using several stages and software programs. 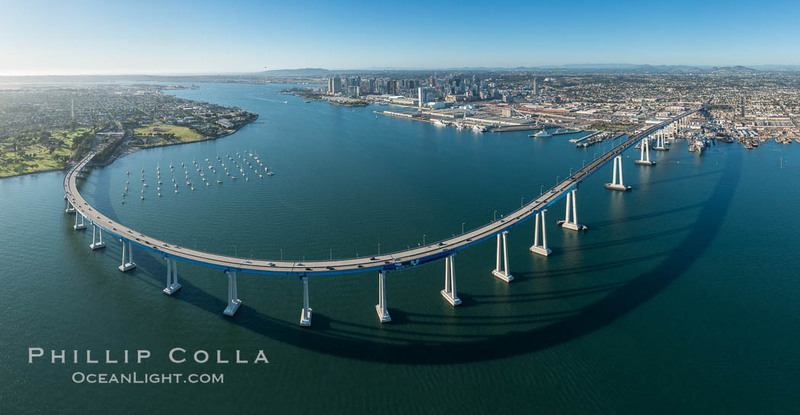 The result is this panoramic photo of the San Diego Coronado Bay Bridge, suitable for printing 50″ by 100″ wide with no interpolation. If you like this, please see my other San Diego aerial photos, or my collection of aerial panoramic photos. Cheers, and thanks for looking!